FILE - Bats are known to carry many zoonotic viruses, which jump from animals to people. Sub-Saharan Africa and Southeast Asia are most at risk from bat viruses jumping to humans and causing new diseases that could lead to deadly outbreaks, scientists warned Tuesday. Approximately 60 to 75 percent of emerging infectious diseases are so-called "zoonotic events" — where animal diseases jump into people — and bats in particular are known to carry many zoonotic viruses. Scientists at University College London, the Zoological Society of London and Edinburgh University looked to map out the highest-risk areas by using a variety of factors including large numbers of bat viruses found locally, increasing population pressure, and hunting bats for bushmeat. Kate Jones, UCL's chair of ecology and biodiversity, said her team first created risk maps for each variable and found, for example, that in mapping for potential human-bat contact, sub-Saharan Africa was a hotspot, while for diversity of bat viruses, South America was at most risk. 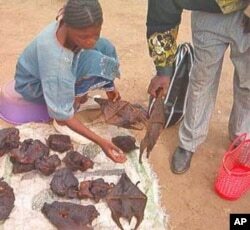 FILE - A vendor sells bats and other bushmeat in market outside Yaounde, Cameroon. "By combining the separate maps, we've created the first global picture of the overall risks of bat viruses infecting humans in different regions," she said. The work was published in journal The American Naturalist. The research, using data published between 1900 and 2013, found that West Africa — the epicentre of the recent Ebola outbreak — is at highest risk for zoonotic bat viruses. The wider sub-Saharan Africa region, as well as South East Asia, were also found to be hotspots. Liam Brierley, a PhD student at Edinburgh University who worked with Jones, said the risk of bat-to-human virus transmission is being driven higher by large and increasing populations of people and livestock expanding into wild areas such as forests.